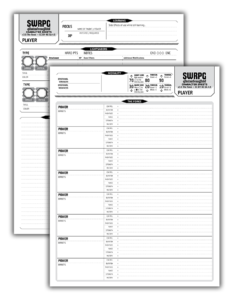 These are the third version of my unofficial character sheets for Star Wars Roleplaying from Fantasy Flight Games, a precursor to the Genesys RPG. 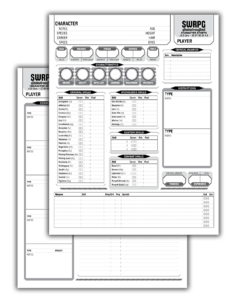 You'll find up-to-date information on the Download page for the character sheets. The SWRPG character sheets are really approaching a stable place. I imagine most, if any, future changes will be very minor. 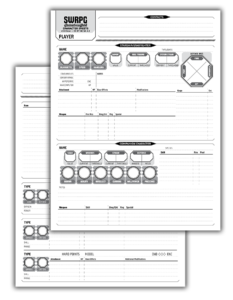 The character sheets are now divided into three sections: Core, Gear, and the Force. Most characters will not need the last section, leaving either 2 or 4 pages for most players. I've found this division more efficient that maintaining separate compact/complete versions, as it allows players to focus on which things they need to focus on during play and print as few pages as they need. 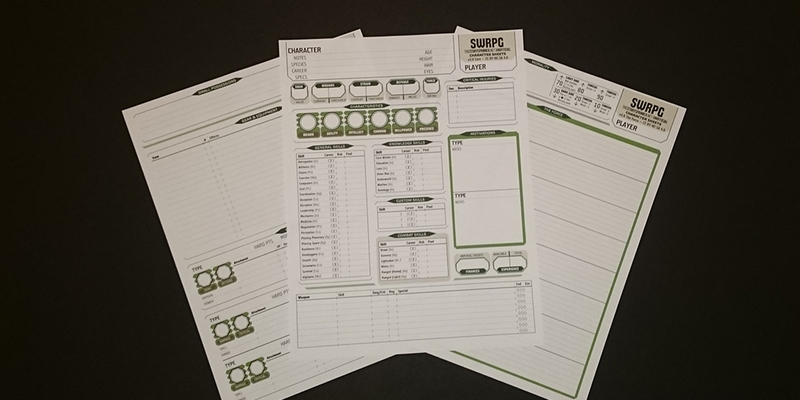 The character sheets are now available in five color schemes (as well as the original black & white): Czerka, Destiny, Hologram, Rebel, and Scoundrel. The Scoundrel, Rebel, and Destiny versions should fit visually with Edge of the Empire, Age of Rebellion, and Force and Destiny, respectively. At the time of this post, I am finalizing both French and German language PDFs. Expect them in the near future, announced by new blog posts. If there are other bilingual folks out there with copies of the core rulebooks in your native language, get in touch with me about working on more translations. I can't pay anything, and I'm pretty sure FFG wouldn't like me paying anything, but I can offer credit for translation and editing on the download page for the translations. Career Skills: there are now two columns of check boxes in the skills table. One check box is for career skills from your career; the other is for career skills from starting specialization. I've found that two sets of check boxes help players more easily decide how/if to stack free skill ranks at character creation. Lightsaber Skill: a blank space is offered to write other paired Characteristics from talents purchased in Force & Destiny career trees. Condition & Encumbrance: now combined into one column. Condition refers to the amount of damage a weapon or item has sustained, with difficulty dice to shade in representing difficulty of repair (see Weapon Maintenance in any core rulebook). Background: a brief space for summary of the character's background as determined during character creation to replace personal notes, which can go in a separate notebook. Connections: rather than offering check boxes for either Obligation or Duty, players now write in either term fully. This change was made while play testing another type of connection, Reputation, to potentially replace Duty and later to use in other Genesys games. Talents: there is now space to write down talents, which I had avoided in the past. However, the Talent Trees are no longer as easy to find completely up to date online, and I've found it helps players to remember all their characters' talents if they write things down. Some slots are longer than others. Short, easy-to-remember talents like Grit or Toughened can fit in the smaller rows at the bottom. Equipment and gear have now been expanded to two pages with some changes. Encumbrance Rating: now located within small possessions. There was nowhere else for it to fit, and next to most of the encumbering items seemed appropriate. Gear & Equipment: as with weapons, equipment now has a column for Condition as well as Encumbrance. Custom Armor: one of the 3 former custom weapon blocks has been replaced with custom armor. A new page relocates the Starfighter/Spaceship and adds a Companion Character block. Contacts: further space for notes. Some players at my table asked for a place to jot down important NPCs they would see occasionally, but not often enough to remember well. Starship/Starfighter: this section has lots more breathing room when using the full page width. Defense arcs now look much nicer, and a section for cargo has been added for use with larger ships. Companion Character: a block for either a companion character or a domesticated companion animal/beast. The Force has also been expanded to two pages. The first page is largely similar, though lightsabers have been moved. Morality: the old version looked nice, but wasted a huge amount of space which is now better used. Reminders have been added for when a character's morality climbs extremely high or falls extremely low. Force Powers: unchanged, but now taking up more space. The new page includes space for two custom lightsabers, as well as completely new sections. Learning: this section has been completely redone to make use of the rules for learning a power or talent as you go in Keeping the Peace, allowing the investing of partial experience and the use of that partially learned talent or power with consequences and/or side effects before it has been mastered. Mentor Notes: space for notes about a mentor and their lessons. Artifacts: space for more notes about Force-related artifacts and relics than would fit with the gear. These are really beauties! Thanks for sharing!! !